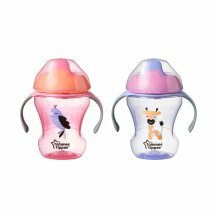 Tommee Tippee Trainer Sippee Cups 7m+ - 2 CT.
Tommee Tippeeï¿½ï¿½ Trainer Sippee Cups 7m+. Helps kids drink for themselves! 2 x 8 fl oz / 230 ml. A super soft spout and easy-grip handles. Helps your baby develop grown-up drinking skills. Removable two-piece valve-easy access, easy clean.